In 4-quart saucepan or Dutch oven, heat oil over high heat. Add chicken, garlic and ginger; cook and stir 2 to 3 minutes. Add the curry paste; cook and stir 1 to 2 minutes. Stir in remaining ingredients. Reduce heat; cover and simmer 30 to 40 minutes or until sauce has thickened and chicken is no longer pink in center. 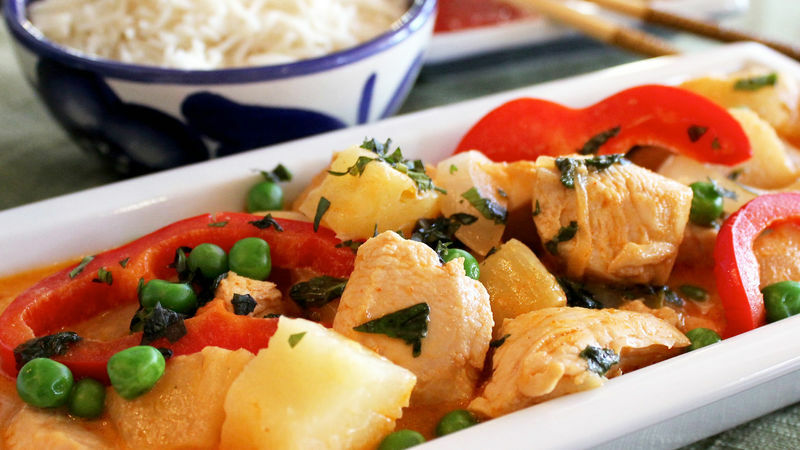 Serve with jasmine or white rice. Feel free to be creative with this recipe and add other vegetables like broccoli, sliced carrots, bamboo shoots, or sliced mushrooms. If you like your food very spicy you can add extra curry paste and some crushed red pepper.